What I originally thought was a misreading of bonnie’s cutting directions for the Strip Twist swap actually was a mis-looking at pictures. When you create a strip twist block, you sew light, dark, light, dark strips together, as a strip set of 4 colors. Then you lay two strip sets, facing each other, one strip with the light on the top (far away from you on the cutting mat), and the other strip set with the light on the bottom (very close to you on the cutting mat). Then you square up the side, and then make a 45 degree cut. Then you square up the side, and then make another 45 degree cut. As long as you are consistent, this should work. When I made my yellow butterfly wallhanging, I did just this, but I had two darks next to each other and two lights. 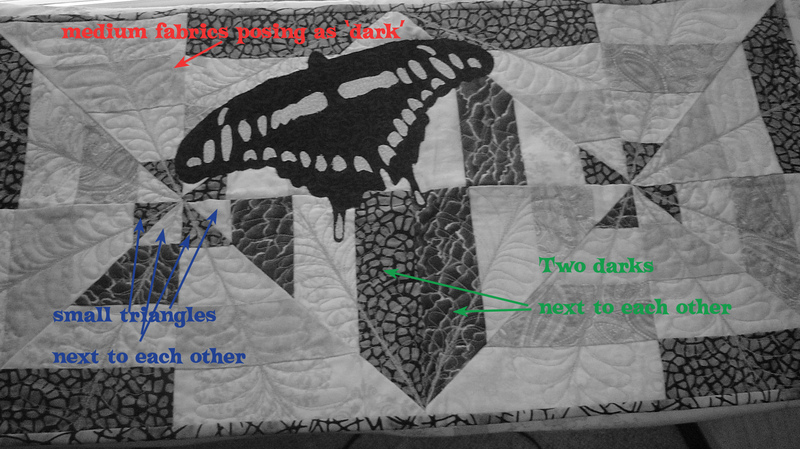 Here is some commentary on the lights and darks I have in this quilt. As you can see, when you face all the small triangles next to each other, you end up with the problem of two dark prints next to each other. 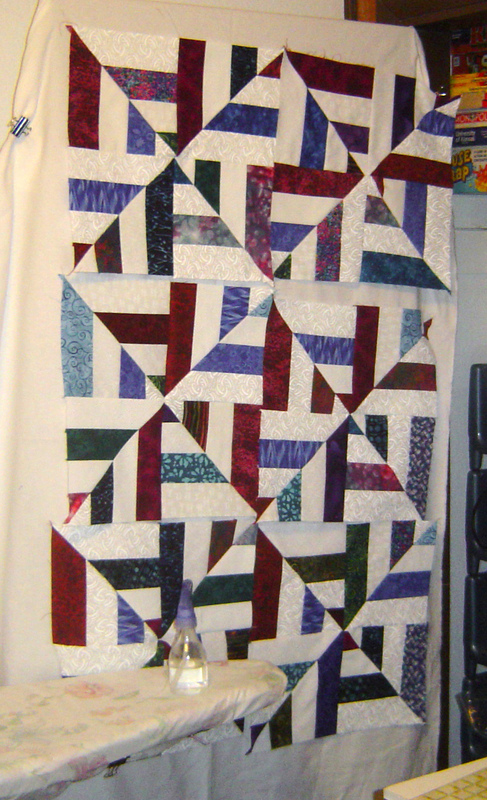 Luckily, for a two block mini quilt with applique, I can hide the mistake in the pattern. When I was sewing these strips together, creating the half blocks, I noticed I had a pinwheel in one rotation on the left, and a different rotation on the right, so I started separating these out. 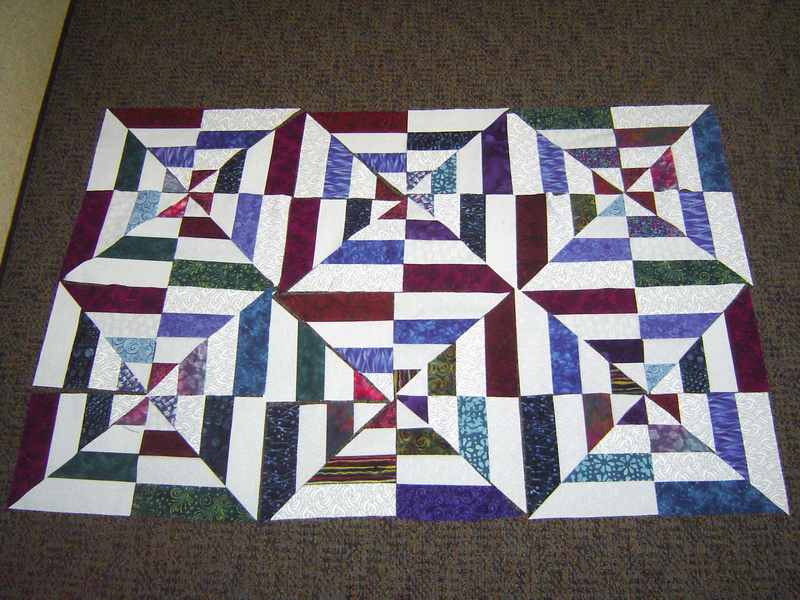 At the retreat, I almost did this quilt, which is half of the blocks that twist only one way. Which in itself, isn’t a bad block either. It has symmetry, and looks pretty nice. Luckily, I decided to actually look at the website, and figure out why I was only getting half blocks. Low and behold, there was a problem with how much I was twisting my block. Apparently, not enough. Each block did not all have tiny triangles to the center, each block had two in the center, and two outward. The disaster would occur if I did my blocks this way for a swap, and the other partner did her blocks the correct way, and suddenly my partners would have to figure out how to make it all work. Crisis averted! Whew! Here is one set of blocks on my design wall showing the correct flipping pattern. Luckily, my partners for the swap, both seemed to be very lose with the colors they wanted in return for the swap, so I just made all the blocks for both partners, the same way. I used the ‘jewel toned theme, and these blocks almost didn’t get sent off (because I loved them). I didn’t expect to like something THIS scrappy. But I did send off the blocks, and I have heard back from both block recipients and both are happy. I can’t wait to see what comes back to me. Now to update the flickr group with these blocks. I had to think the cutting part through since the directions are for a right-handed person. In my case the first set of strips had the light color on the bottom toward me and the dark was placed on top of the light strip. I had to reverse the instructions for cutting. I was one of the lucky recipients of your blocks and they really are beautiful. 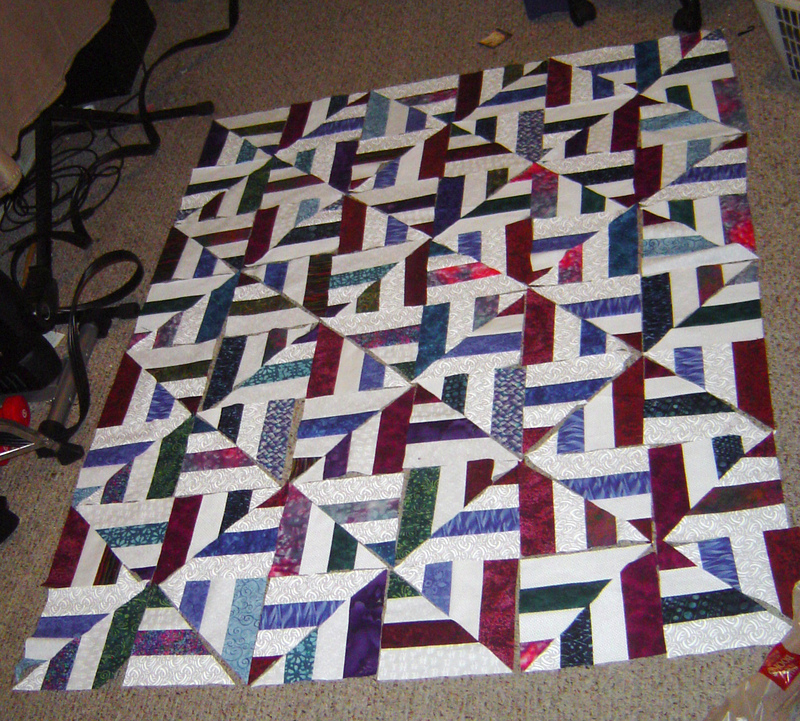 I’m trying to piece my blocks tonight and boy are my quarter squares wonky. I was wondering if you did any square up of the quarters square before piecing the final blocks? If so, what was your “target” quarter block size? Thanks! No I didn’t square up the quarter blocks. I wonder if you square up the blocks too much, the main block will become really small and be hard to match with the other person’s blocks. I can’t really remember the size of the block. I just received my blocks today from one person, and the block finishes 15 and a half (but I’m not sure if this is what the finished block is supposed to be without looking it up), and so that would make each quarter block 8 by 8 I think.